With funding from the East London Industrial Development Zone and expertise from Nelson Mandela Metropolitan University, entrepreneur Nikolas Jankovich has developed the next generation “hybrid” street light. 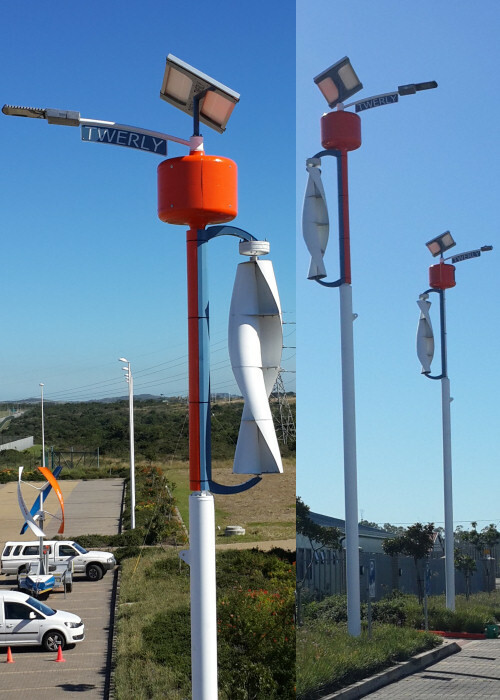 Harvesting energy produced by wind and the sun, the Twerly™ which is set to “revolutionise” the future of street lighting, uses a vertical axis wind turbine (VAWT) to harvest wind energy and a standard 140W photovoltaic (PV) solar panel to wind turbine to harvest the sun’s energy. The combination of the two renewable energy sources provide energy to a battery which then provide powers to a modern light-emitting diode (LED) luminaire. A delighted Jankovich said he was thrilled with the progress made and was thankful for the opportunity of working with “amazing engineers” from eNtsa, NMMU’s engineering technology institute. The Twerly, which is visible on NMMU campuses, offers previously disadvantaged communities the possibility of lighting unlit areas. What’s more, the Twerly also has embedded technology allowing it to be used as a surveillance tool and a WiFi hotspot. “The Twerly will change people’s lives,” says Nikolas. The School of Engineering’s Dr Russel Philips engineered the VAWT and all its components allowing wind energy to be harvested at the lowest wind speeds. In less than five years, the Twerly has evolved into a solid product that is “set to revolutionise the way we light up our planet at night. “It is a dream come true and I am proud to have been a part of the team that took Twerly from a mere concept to where it is today!’’ says Dr Phillips. For eNtsa project engineer Riaan Opperman, the Twerly has turned out to be one his most “fulfilling projects”. “Looking at where this project is heading truly excites me,” says the engineer who re-invented the first prototype by providing crucial CAD drawings for manufacturing specification. He also oversaw the cutting and bending of parts as well as manufacturing and assembling the components that make up the Twerly. eNtsa’s Etienne Phillips and Akshay Lakhani designed, developed and built the circuit boards that controls and protects the system from exceeding its limits. “Seeing the street light switch on at night for the first time, made me realise the importance of the project and how it would impact the environment, especially in isolated areas where people do not have access to electricity,” says Akshay. Project leader for Twerly Development Etienne Phillips agrees. He said the project has produced two very important outcomes: a benefit to communities that can rely on a dependable source of light and a source of a vast amount of real-time data on everything from battery life to renewable energy availability collected from real-world sites spread throughout the country. The next phase of the development is to turn every Twerly™ street light into a WiFi hotspot so that everyone can benefit from Internet access. Dr Russell Phillips, Etienne Phillips, Riaan Opperman and Akshay Lakhani as well as with Jaci Barnett, Mary-Ann Chetty and Colin Schroder from the Innovation Support and Technology Transfer were all key players in the producing the Twerly at NMMU.